LP Software is Proud to Announce the Release of a New Mobile App for our Compliance Audit Software! Users of LP Software's popular Compliance Audit Management System (CAMS) will now be able to manage audits from any iPad, iPhone, or Android mobile device with the release of a new mobile app. CAMS will allow users to take audits on any mobile device, with or without an Internet connection. Work more quickly and efficiently and get a comprehensive view of your audit results, action plans, follow-ups, outstanding tasks, etc. ... all while on the go! When implementing an Audit system in your company, you need something that is easy to use, yet has all of the powerful features that are important to your organization. 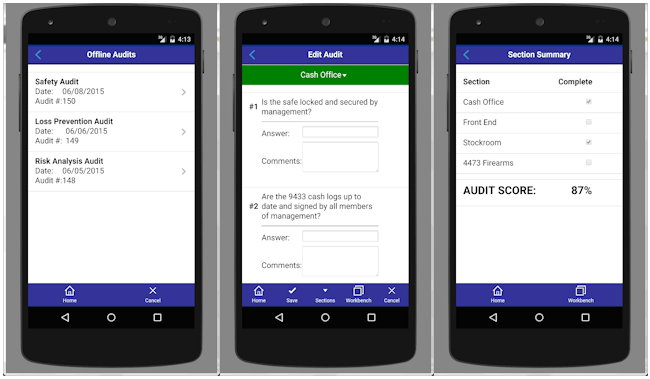 CAMS Audit and the new mobile app are designed to help reduce LP, Operations, Internal Audit and Risk Managers' time and effort in finding, tracking, and responding to vital Information. Learn more about CAMS here. LP Software's new mobile app allows users to perform audits on any Apple or Android mobile device. Today, LP Software has over 200 clients worldwide. They provide customizable software for companies of all sizes - anything from simple incident management software to global incident management & audit software. Their original LP case-management software (LPMS) has developed over time into a broader enterprise-wide system. LP Software's solutions also offer the ability to manage HR issues, Compliance Auditing /Checklists, Accidents, OSHA reporting, Award Management, and Task Management.